Today is Superbowl Sunday, and while I confess to only recently accepting that Sundays are were for football watching, I've always been into the Superbowl, for what else? The food. I've progressed (just a little) since college when it was dips and Chex mix that I offered up. The last few years, I've been fortunate enough to watch at friends' houses where their tvs are bigger than mine, and their homemade pizzas or 5 gallon pots of chili are too good to compete with. 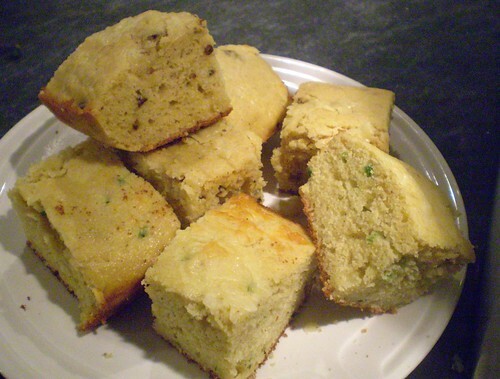 So, that's why I decided to share with you my recipe for not chili, but cornbread, the perfect partner to chili. Despite this, it is often the overlooked dried-out bore that most people will happily pass over. This version is different, and best of all you'll actually want to eat the leftovers the next morning when you wake up feeling sick from too much wings and beer from the night before. If you can, I'd suggest trying to find some coarse-ground cornmeal at the greenmarkets. Around the NYC area, there are quite a few farms reviving the local grains options. Here's a list of regulars at the greenmarkets, (check for the Cayuga brand too). Of course, a high-quality supermarket brand will work as well, just look for one that is stone-ground, which means that some of the hull and germ has been left in, which equals better nutritional value and flavor. This cornbread is moist without being heavy thanks to the use of buttermilk, and is sweet but not cloyingly so. The sweetness really works nicely with the smoky flavor that a small amount of chipotles (the chipotles in adobo kind) diced up will add. You can of course, use jalapenos if you'd prefer. Or, do as I did, and make a double-batch, one half with chipotles, one half with jalapenos. I guarantee the leftovers will not go to waste, and that's the only thing I'll be waging a bet on tonight. Adapted from Allrecipes.com. This recipe would work great as mini-muffins if you'd rather serve them that way. Just drop the baking time to 15-20 minutes. Serve any leftovers warm with a drizzle of honey for breakfast (or dessert). It also can be easily doubled for a crowd. Preheat your oven to 375 degrees Fahrenheit. Grease your 8 inch baking pan (or 13x9x2 inch pan, if doubled), or muffin tins. Melt the butter in the microwave, or in a small pot. While butter is melting, sift together the cornmeal, flour and salt. Set aside. Place sugar in a large mixing bowl and pour in melted butter and stir together. Add eggs quickly mixing till smooth. Measure out buttermilk and mix baking soda into it before adding it to the batter. Add to the bowl and stir. Add sifted flour mixture to batter and fold in till completely incorporated. Add chopped chipotles and mix till distributed throughout. 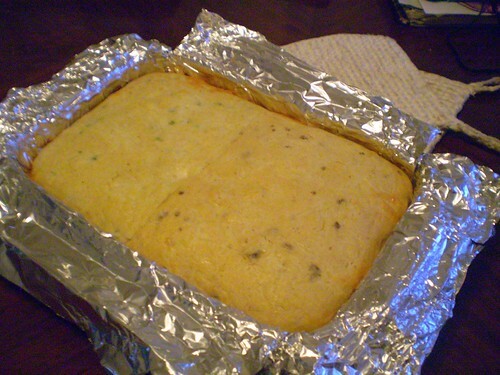 Pour batter into prepared baking pan and bake about 30 minutes. Set on a rack to cool before cutting into squares.